Hi everyone! How is December treating you you so far? I am particularly excited because this is the finale of 2016 and I am looking forward to a greater year ahead! 2016 has been amazing, with ups and downs needless to say but what is 365 days without occasional loops and surprises? To look good for my last few weeks in December, I thought it was about time to do something to my hair. All these while, I am grateful to have a hairstylist that has been trimming my hair at the comfort of my personal space, without having to set foot to the salon but you know a change of ambience is always good! I still have my hairstylist to cut my hair. 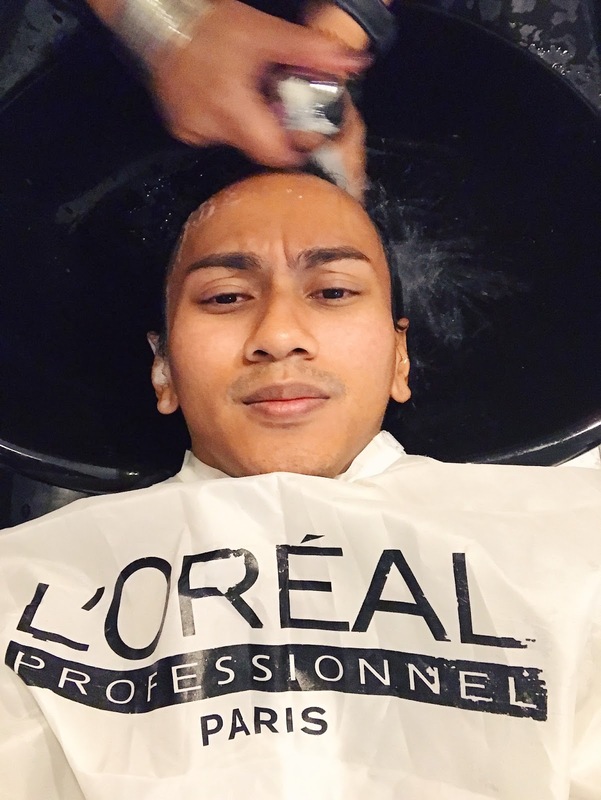 After all, she is familiar with my taste and the whereabouts of my head, but for treatment, Crescendo Hairdressing is my to-go for my hair woes. Crescendo Hairdressing has two outlets and I went to the one at Changi City Point because of its proximity to home. I was totally new to hair treatment honestly because I never needed any but as I grow up, I tend to be more appreciative of my natural curls and at the same time wanting it to be smooth. Shampoo and conditioners are great but the effects tend to be short lived. I am not one who dye my hair or let alone straighten my hair because I embrace what is natural. My natural curl, if goes any softer and smoother, will look as good as those L'oreal ads, the alpha version perhaps? If you have never gone through any hair treatment and would like to have one, look no further! My arrival was warmly welcomed by my assigned stylist for the day, her name is Jaz, she put me on a chair and told me a summary of the hair treatment. Initially, I caught no balls. It was all foreign to me but of course as the process went by, I was enlightened once again. Jaz started with cleanser to wash away all the dirt on my hair. 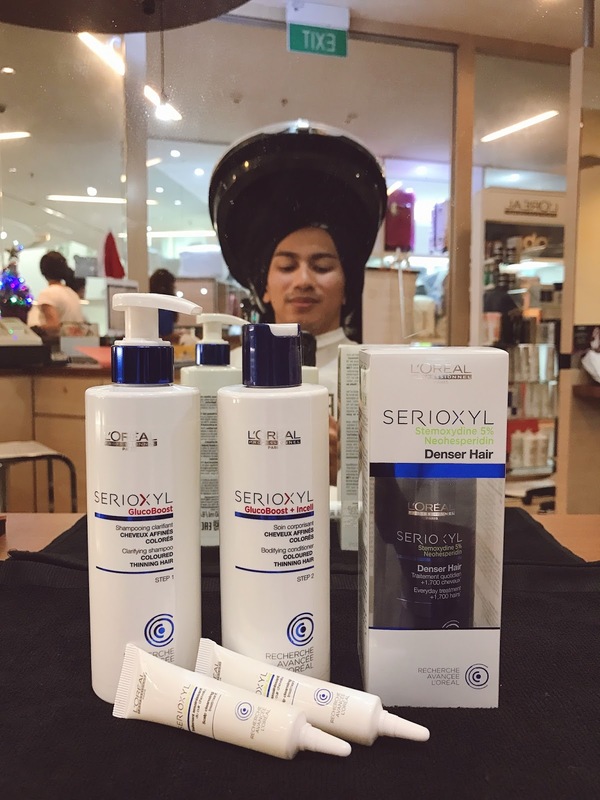 Using L'oreal's Serioxyl Scalp Deep Cleansing Treatment, this salon-exclusive pearly white prep-shampoo purifies the scalp and hair, thanks to its very gentle cleansing action. 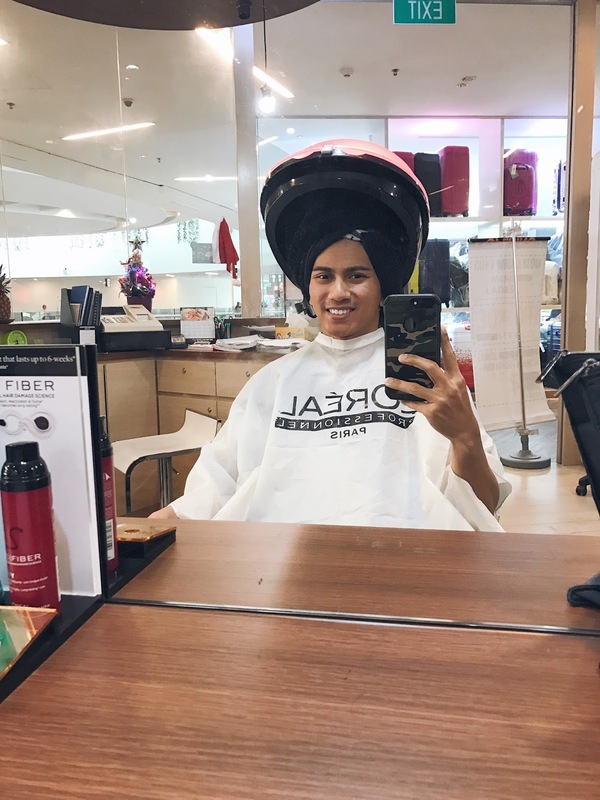 Scalp cleanse need to be thorough to ensure that my hair absorbs all the good properties of the products that would be used in the next few steps! I enjoy lying on the basin for rinse, don't you just want to fall asleep while your head is massaged and water runs through your hair? Then on we continued with the shampoo, conditioner and so on before putting me under the micro mist and red-blue light therapy. I use hairspray for most events that I attend because when it comes to hair styling, I do not like to get my hands on hair products. Hairspray simply minimizes the hand contact entirely. Jaz taught me something new! Sometimes I just want my hair to be intact for a while without using too much hair spray, just for casual outing and all. Now, I found new motivation to prim my hair before I go out using just a little hair spray by spraying it on a hairbrush instead of applying directly to my hair. That way, I do not have to use too much, and certainly would be easier to wash! Thanks to Crescendo's well trained stylists, I have a new found revelation on hair styling. So, if you want to get your hair fixed, come down to Crescendo Hairdressing! We can go together and yes, share some great stories for the great new year ahead while being under that martian-looking mist machine! Will share more details on my next visit!